Ryan T. Schmidt is a talented artist and sculptor inspired by the reflective properties of stainless steel. 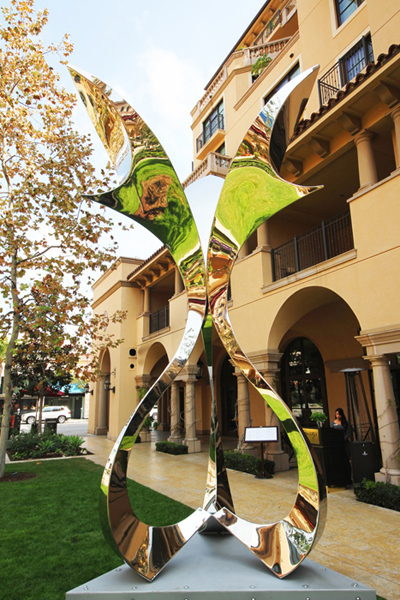 His sculpture “Ascension” was part of the Arts of Palm year-long public art installation, which was one of a series of events celebrating the Beverly Hills Centennial in 2015. This elegant stainless steel creation features a flowing, abstract design with graceful curves and beautiful reflective properties intended to inspire viewers to contemplate their own existence. The building blocks of this sculpture consisted of three large individual components, each with a curvilinear geometric form. Constructed from 11 gauge 304 stainless steel, the artist welded the pieces together to create an organic form flowing upward and reaching outward. To complete his vision, he worked with us here at Henry’s Metal Polishing to produce the highly polished appearance that is integral to all of his stainless steel work. In order to create a seamless transition between each of the three workpieces, we ground away excess weld material and filled voids left in areas with an insufficient amount of filler. Using a progression of finishing disks from 80 grit to 600 grit, we smoothed all of the seams and made it appear as a single entity. With our custom polishing equipment, we achieved a lustrous #8 mirror finish on every surface. Afterwards, all that was required was a few finishing touches to remove weld marks and heat discoloration. 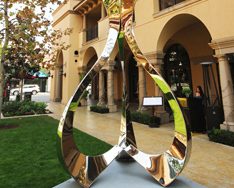 We were proud that our exceptional metal polishing capabilities helped this gifted artist realize his vision. If you would like to learn more about this project or our welding and polishing capabilities, contact us today.